Summary: Good Food to Go is the ultimate guide to packing healthy lunch boxes with food that kids will enjoy and parents can feel good about. Back-to-school means back-to-lunch-boxes, and the daily quandary of what to put in them. 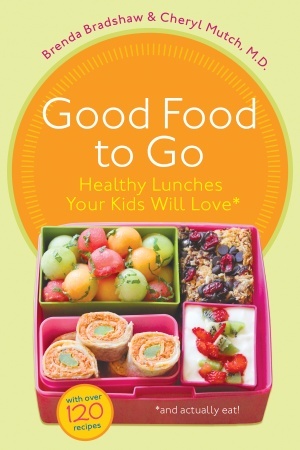 With this new book, two working moms – one a teacher, one a pediatrician – offer creative ideas for balanced lunches and nutritious snacks, as well as up-to-date health tips that will make packing lunch a joy and not a chore. Are you looking for something different to put in your kid’s lunches? Something healthy but that they will like and eat? This book has tons of ideas for you. As with most kids, mine are picky too and so some of the recipes they wouldn’t even touch but many others, I think they might. Plus they can help make them which is proven to improve the odds of your child eating them! Plus there are sample menu planners, a shopper’s guide to pesticides and a resources section. First of all may I say that if my parents called leftovers “Encore Performances” maybe I would have eaten them more? Great name! The Table of Contents doesn’t do this book justice. It’s not just a list of foods to pack. The book is full of informative health tips, nutritious recipes and tips to get your child to try new things. These aren’t just recipes for a new kind of sandwich with processed meats or new snacks to buy, these recipes could be actual meals for anytime (and I will be trying them as such too!.) Then if the kids like them, I can try making extra to send the next day for school. All of the tips and hints are in orange boxes and they are VERY helpful. This is a great nutrition book and I learned a lot.